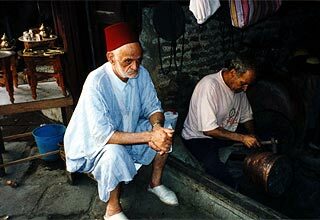 One of oldest continuously inhabited cities in the world, Fez is a cornucopia of sounds, from the bell of the garab (water seller), to the cry of the men who lead their donkeys through the narrow alleyways. A walk through Fez is like a journey back in time. 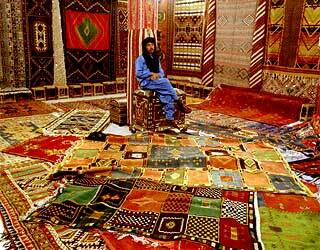 A shop in Fez is piled with carpets. 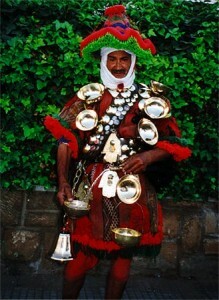 The traditional red fez is still worn, but it is seen less and less frequently. 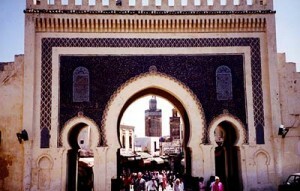 The Blue Gate is the main entrance to Fez’s medina, the older section of the city.